Do we really understand unconditional love? It is a beautiful concept, unconditional love. Some people may even believe they understand it. But we are not really a society that promotes this intention. Those that truly love unconditionally would be considered naive and cautioned to step back and protect themselves. We seem to believe that love hurts, and we must protect ourselves. We are on guard to love selectively, once we believe someone won’t hurt us. But are we truly loving if we only express this love with people we believe will love us back? Do we really only love people we believe are safe and that have our best interests at heart? Seems to me that this sounds like a love wrapped in pretty ribbons of fear. Love wrapped in such constraints may not be love. It may just be insecurity dressed up as love. We want something from this person we say we love. Perhaps we are seeking their emotional support, or comfort or protection. We sense they will calm our insecurity and thus we deem them safe to love and expose our vulnerability. Now we can say we love them and open ourselves to them. Opening ourselves seems like love, feels like love, because it allows us to relax and feel safe. Don’t you suspect that true unconditional love is an act of sharing, not getting? There is no thought of what we need from the exchange. If we are judging and evaluating how we will feel if we share love, then perhaps it isn’t love. Unconditional love is a beautiful thing because it allows us to experience love every day. I suspect it is an outpouring of genuine emotion for others. It is not the least bit judgemental or analytical. Unconditional love is rather like the sun shining. It just shines on everyone because it can. What if we could love and share love, just because we can? We would not bother to evaluate your worthiness to receive our love, we would just give it. And here’s a thought, what if we gave it everywhere, shared love as the sun shines, indiscriminately? What a world we would have if enough people just spread love all around for no reason. Now I know you may be getting resistant to this flakey feel good idea, and if you are perhaps it is because you misunderstand the implications of loving someone. I believe love is an emotional energy generated from within us. A beautiful feeling that can be extended out to others. A healing energy that uplifts people and makes them feel accepted and included. And that is the magic of love. A non-judgemental acceptance and joy that you exist. How would you feel if the people around you looked at you this way? They weren’t trying to help you, correct you, evaluate you, they just seemed to smile and appreciate you. Unfortunately society has wrapped love, not only with ribbons of fear, but ropes of obligation and duty. Thus if we love someone we will have expectations of what they will do for us and how they should make us feel. Have a look at your relationships and you will see the hidden expectations. I hate to say it, but I suspect it isn’t really love you are experiencing if you are trying to shape, change or control someone. It is simply a ribbon of fear or a rope of obligation. 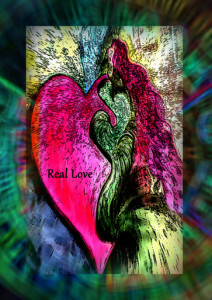 Real, unconditional love sets people free to be who they are, who they want to be. Real love is open to discovering and sharing with them. It does not try to get, but only to give. So the question is, if you could love unconditionally, without expectations, and it did not matter if someone returned your love, wouldn’t you try it out more? If you loved more people, without restriction and obligation, you require nothing of them, they require nothing of you, don’t you think you would experience more love in your life?